We know you never want to see your animal companion in pain or discomfort. That's why our veterinarian team at Oakland Park Animal Hospital provides fast and effective treatment for gastrointestinal distress in cats and dogs. To learn more about pet GI problems, keep reading. What are common diseases related to gastrointestinal problems in pets? Gastroenteritis is a common GI disease that causes irritation to the stomach, stomach lining, and intestines of your cat or dog. It can be caused by any of the above factors, and may present with other common diseases including inflammatory bowel disease, metabolic disorders, and viral or bacterial infections. 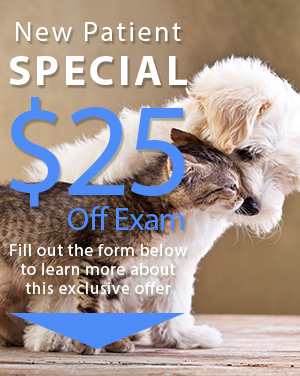 Based on the results of our diagnostic testing and the severity of your pet's condition, we'll initiate the right treatment as soon as possible. Treatment may include induced vomiting, IV fluids, and medications. We may instruct you on how to care for your animal at home, or in severe cases we may ask that you hospitalize your pet until the symptoms are under control. How can I prevent gastrointestinal problems? The first and most important way to prevent a gastrointestinal upset in your pet is to avoid giving your pet table scraps. Many of the foods we eat can be harmful to your animal (plus, you may be increasing your pet's risk of overweight/obesity). Keep your pet healthy by maintaining a regular parasite prevention schedule through monthly medications. Our Overland Park, FL veterinarians can help you establish the right schedule and dosage to fit your animal's breed, age, and size. Supervise your animal around food, and if you have any plants that are known to be toxic to animals, consider removing these from your home or at least ensuring they are out of reach of your pet. If you notice any unusual signs or symptoms of gastrointestinal distress or disease, then call our vet team right away. The sooner we can evaluate your cat or dog, the sooner we can initiate the proper treatment to help make sure your pet starts feeling better as soon as possible--not to mention avoid potential serious and/or long-term complications. Is your dog or cat demonstrating signs and symptoms of a gastrointestinal problem? 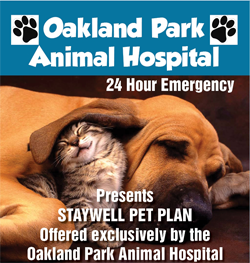 Call our veterinarian team anytime at Oakland Park Animal Hospital and get the help that your sweet pet needs! Our number is (954) 731-4228. We also encourage you to ask our friendly staff about our other veterinary services and specials.